OVERLAND FROM CHINA TO EUROPE: Revival of Silk Road Route Will Cut Transit Time. The train traveled from NW China to Azerbaijan and represented the culmination of an initiative of Kazakhstan Railways. The government of Azerbaijan is developing a new, 1,000-acre port complex near Baku, capital of Azerbaijan. Completion of railway project offers new opportunities to transport cargo from China over a faster land route. 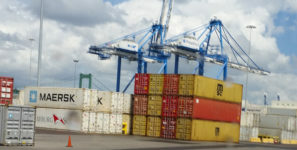 The first container block train from China arrived at the Port of Baku in Azerbaijan last week. A welcoming ceremony at the new ferry terminal was attended by senior Azerbaijani, Kazakh, and Georgian officials, as well as by representatives of their national ports, railways and shipping lines, and members of the diplomatic corps. The train, which traveled from Northwest China to Azerbaijan, represented the culmination of joint efforts by the Coordination Committee on the development of Trans-Caspian International Transport Route (TITR), an initiative of Kazakhstan Railways and comprised of ports, railways, shipping, and logistics companies of Azerbaijan, Kazakhstan, Georgia, Turkey and China. The train, carrying 82 twenty-foot containers, departed Shihezi city in China’s Xinjiang Uygur Autonomous Region on July 28, travelling 2,500 miles before reaching the Caspian port of Aktau in Kazakhstan. From there, the train was transported by rail ferry to the new Port of Baku in Alyat, 43 miles south of Azerbaijan’s capital, Baku. The government of Azerbaijan is developing a new, 1,000-acre port complex near Alyat that includes logistics zones, common-use oil supply-base facilities, and customs bonded areas. The development is a part of a larger strategy of Azerbaijan’s President Ilham Aliyev to strengthen and diversify the country’s economy. The upcoming completion of the Baku-Tbilisi-Kars railway project linking rail networks of Azerbaijan, Georgia and Turkey with the European Union offers new opportunities to transport cargo from China over a shorter, faster land route and represents a revival of the once active land-based Silk Road trade between China and Europe. The current maritime route from East China to Europe takes 30 to 35 days. The Coordination Committee members aim to shorten door-to-door delivery of China’s goods to Europe to under 14 days.